"Your mind, your body and your heart will always believe what you tell it.Feed it love, feed it truth and feed it faith." Some of you might be familiar with the words "man shall not live on bread alone" and simply put, the motive behind this little scripture is that physical nourishment is not sufficient for a truly healthy life. We have a need for love, we have a need for friendship and we have a need for goodness that cannot come from food alone. Since feeding both your heart and your body is important, I thought I'd start a little weekly blog series titled 'Good Food' that shares my favourite places and ways to fully nourish mind, body and soul. A good friend recently told me, 'it is impossible to be angry - if you are grateful'. Very simply put, this is one of those situations that is so much easier said than done. Responding to frustration with gratitude makes so much sense, but is so much harder to walk out in the everyday moments. While researching this theory I came across so many studies that support this concept. Which leaves it down to practice, so the more I engage with this idea of gratitude in response to irritability and anger, the higher the chances of it becoming a habit and a way of life. Concluding in the more we feed our hearts with gratefulness, the slower we will be to get angry. This is something I am currently practicing and although harder at times, it has been consistently worth it. Numerous studies have proven the power and influence that being grateful has on all aspects of our lives is broad and has long lasting impact for a better life... Check out the above article for an entire list of reasons to cultivate gratitude. Now that we are mindful of gratitude, let me express the gratitude I have for one of my favourite spots in Falmouth! 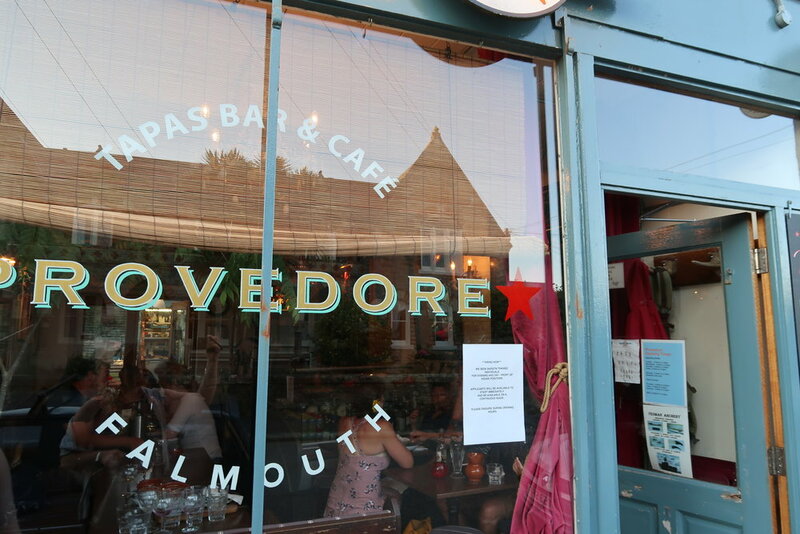 Provedore is an independently run tapas bar and cafe amidst a Falmouth neighbourhood. It's quirky and rustic feel creates a beautiful atmosphere that adds exponentially to experiencing their unique food dishes. By day an ideal spot for coffee or lunch with friends and by night your tastebuds will be razzled with the most delightful artisan plates of locally sourced ingredients inspired by travel, mostly Spanish, North African and occasionally Malaysian styled dishes. Pair your food with an incredible selection of wines, enjoy the occasional visit from accordion player Seamas and you're set to have a spectacular evening! Be sure to take cash with you and get there early (6pm-ish) as reservations are not a thing at this neighborhood gem and you're going to want a courtyard seat if you're going in the summer! Here are the photos I snapped the last time I was there and a link to their Opening Times.